You hear the faint, plaintive whisper every time you head down to your basement. At first you think you’re imagining the tiny, barely audible voice. “I miss you... Have you forgotten about me?... When will we be together again?” You search the basement, anxious to prove to yourself that you’re not going crazy. Then, suddenly, you realize... it’s your bike. It’s been a long winter. But now, finally, you can legitimately start to plan your cycling season and get ready for that first sunny, blue-sky, tulips-in-bloom ride outside with short sleeves. To help out with that, here’s a list of questions you might want to ask yourself now, so you can get answers in time to enjoy the results, when you can actually get out and ride without freezing. Whether you’ve been riding a trainer in your basement, hitting spin classes, or doing nothing at all, now is the time to take realistic stock of your fitness and set some goals for this coming cycling season. Do you want to ride faster? Farther? Improve your pedaling style? Now is the time to ask yourself those questions. Different riders will have different goals, and books like The Cyclist’s Training Bible by Joe Friel can help you decide what goal is right for you, and how to separate reasonable, attainable goals from wishes that aren’t grounded in reality. This is the perfect time to get your baby down from the rafters and give it a good going over. If you do find anything wrong, the head start will give you time to get it repaired before finding out the hard way on that first spring ride. Clean and lube the whole bike, especially the chain, using biodegradable cleaner, a toothbrush or other small brushes, and an old towel to clean up. Pump up the tires, then check them and your brake pads. Do either need to be replaced? Does your drivetrain still shift smoothly? Cables can stretch during long-term storage. Do your wheels spin smoothly, or do they need to be trued? Now check the frame while it’s clean. Are there any telltale cracks, dents, or wrinkles in the paint? If there are, don’t ride until you get it checked by a professional. Speaking of professionals, this is also the best time to skip all of the above and seek out your local bike shop mechanic, who’s trained to do all of this and much more. Get on the tune-up list early before the rush hits to make sure you get your bike back ready to ride when nice weather finally happens. If you can’t get to the bike shop, services such a Velofix (velofix.com) will come to you. Is my other cycling gear ready? Make sure your seat bag is ready to go, with at least a spare tube, tire levers, mini-tool, patch kit, a few zip ties, and some emergency cash. If you use CO2, make sure your cartridges match the air chuck! It’s no help out on the road to have non-threaded cartridges if your chuck requires threaded. Also check your spare tube to make sure the valve stem is long enough to work with any deep section rims you may be using. Lastly, if your patch kit has been hiding unused in your bag for years, the patch glue may have dried out, leaving the patches useless. Check your wardrobe, too. Now is the time to see if any threadbare shorts need to be replaced, or if you need new gloves or new pads to replace the ones in your helmet that have gotten, ah, fragrant. This is also a great time to check with your local bike shop for any specials they are running on leftover winter clothing to help you get ready for riding late into next fall. Also don’t forget those shoe cleats. Need new ones? Again, your local shop will have what you need. Also don’t forget to check your bottles. The sugar in sports drinks can leave residue that can breed germs, and it is probably time for a thorough cleaning or new bottles. Last but perhaps most important, make sure you have the brightest red taillight available and use it on all your rides, even in daytime. What rides and events would I like to do this season? If there are events or specific rides you’ve never done, or those that you would like to do again, now is the time to get them on your calendar and get registered. Many events have early registration discounts, and some have limited capacity. If this is the year to do your dream event, plan now to make it happen later. 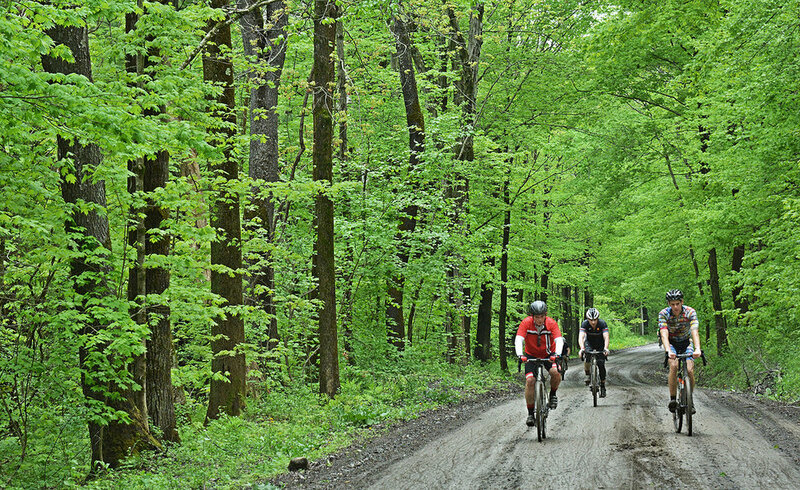 Many ride organizers will be exhibiting at the Adirondack Sports Summer Expo, including early season events like the Black Fly Challenge Gravel Grinder on June 8, Capital Region Tour de Cure on June 9, Cycle Adirondacks’ Weekender at Paul Smith’s College on June 28-30, and Erie Canal Bike Tours has an adventure for every cyclist with multiple trip dates. There’s also ADK’s Ididaride Bike Tour on July 27, Ride for Missing Children on Sept. 20 – and all season, rail biking in North Creek with Revolution Rail! Should I join a bike club? If you’ve never joined a bike club or other cycling organization, then you’re missing out on great events, new cycling friends, and a variety of cycling related resources to help you get fit and enjoy the sport. With over 800 members, the Mohawk Hudson Cycling Club (mohawkhudsoncyclingclub.org) is the largest club between New York City and Montreal. MHCC hosts almost 300 group rides per year, and their Albany County Century Weekend in September is a great opportunity to do your first century ride. If you’re looking for rides and fellowship further north, the Warren County Safe & Quality Bicycle Organization hosts a complete website (bikewarrenco.org) that offers ride maps, event information, and supports advocacy to promote cycling of all kinds in Warren County. Both organizations will be exhibiting at the Summer Expo, so stop by and introduce yourself. Dave Kraus (dbkraus@earthlink.net) of Schenectady is a longtime area cyclist, photographer and writer. Visit his website at krausgrafik.com.